Munt Fuji is the Chūbu region's maist famous laundmerk. The Chūbu region (中部地方, Chūbu-chihō) is the central region o Honshū, Japan's main island. Chūbu haes a population o 21,715,822 as o 2010. 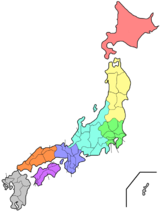 Chūbu, which means "central region", encompasses nine prefecturs (ken): Aichi, Fukui, Gifu, Ishikawa, Nagano, Niigata, Shizuoka, Toyama, Yamanashi, an eften Mie. It is locatit directly atween the Kantō region an the Kansai region an includes the major ceety o Nagoya as well as alang Paceefic an Sea o Japan coastlines, extensive muntain resorts, an Munt Fuji. The region is the widest pairt o Honshū an the central pairt is characterized bi heich, rugged muntains. The Japanese Alps divide the kintra intae the Paceefic side, kent as the front o Japan, or Omote-Nihon (表日本) sunny in winter, an the Sea o Japan side, or Ura-Nihon (裏日本), the back o Japan, snawy in winter. ↑ Nussbaum, Louis-Frédéric. (2005). "Chūbu" in Japan Encyclopedia, p. 126 at Google Books.